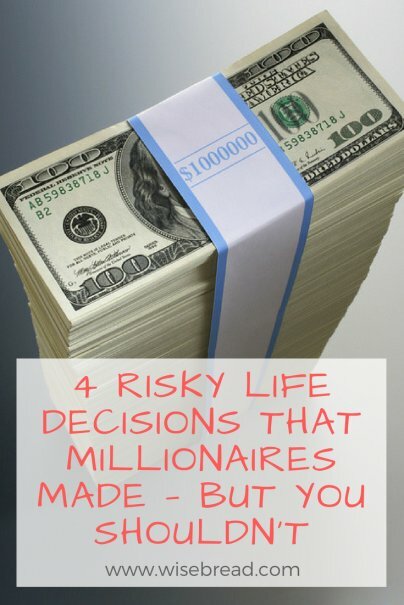 When you read about self-made millionaires and billionaires, it can often seem as if their success was an inevitable result of their tenacity and savvy decisions. But sometimes those choices are less savvy and more borderline irresponsible — and it would be foolhardy for most of us to try some of these stunts in our own lives. There are a number of hugely successful individuals who did not complete their high school educations, and it did nothing to stop them from reaching the top of their fields. For instance, Wendy's founder Dave Thomas, Tumblr developer David Karp, director Quentin Tarantino, and Virgin Atlantic founder Richard Branson all dropped out of high school and still went on to become multi-millionaires. Yes, these millionaires were able to build wildly successful careers without completing their formal educations, but it's a mistake to assume that most people can emulate their irregular paths. To begin with, a worker without a high school diploma earns an average of $520 per week, according to the Bureau of Labor Statistics. Assuming a year of constant earning (which is not necessarily the case, as many workers without a diploma cannot count on steady employment), this works out to $27,040 annually. Just completing high school means a bigger paycheck, as workers with a diploma earn a median weekly income of $712, or $37,024 per year. In addition, high school dropouts have the highest rate of unemployment in America at 6.5 percent. Workers with at least a high school diploma have an unemployment rate of 4.6 percent, while the national unemployment rate is 3.8 percent overall. Clearly, completing your high school education is one of the surest ways to ensure financial stability. From Elon Musk, who funneled the money that he earned from the sale of PayPal into Tesla and SpaceX, to Sara Blakely who put the $5,000 she had managed to save from her sales job into the business venture that became Spanx, there are a number of successful entrepreneurs who gambled their own funds on their business ideas. Between these inspiring stories and the prevalence of such gambits working out in movies, it would be easy to assume that being willing to put your own money into a business venture is the secret to entrepreneurial success. Such business owners may have solid business ideas and just as much drive — but without a healthy dash of luck or opportunity, they may be stuck declaring bankruptcy after putting all of their own money into the business. I supported myself on credit. I had five credit cards with about $10,000 each available. I said to myself, 'You have $50,000 to get published.' I got to $38,500 in debt. I went back to being a law clerk for money and a week later my first novel was sold. Scottoline's decision to live off her credit cards paid off. She is now the successful author of nearly 40 books, many of them of New York Times best-sellers. Fred Smith, the founder of Federal Express (now known as FedEx), would not currently be bringing in profits of $4.4 billion if it weren't for a remarkably lucky game of blackjack. Smith started the company in 1971 with a $4 million inheritance, as well as $80 million in loans and equity investments. But by 1973, the company was struggling. When the company's funds diminished to a mere $5,000, it meant that there was not enough money to fuel the planes for the coming week. So Smith took that money to Vegas and used it to play blackjack. Miraculously, he won. His lucky blackjack game turned that $5,000 to $27,000, which would cover the coming week's fuel needs. Though it did not solve all of FedEx's cash flow problems, Smith saw his lucky break as motivation to seek more funding. Smith was sanguine about his decision to gamble the last of the company's money. He knew that they would not be able to fly the following week without more money for fuel, so leaving the money in FedEx's coffers would have spelled the end anyway.